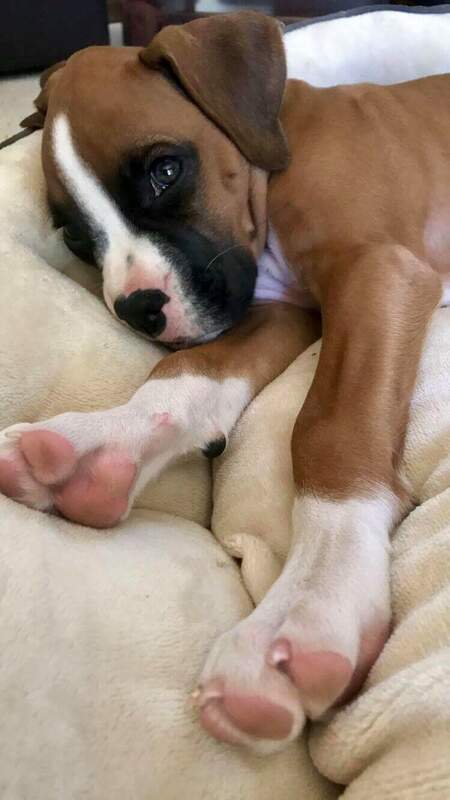 We at Kloud 9 Boxers love to hear happy families' stories of how well their new puppies are growing and getting used to their homes. Also, the experience you had with our training program (if you took advantage of getting your puppy/dog trained). Please feel free to email us and tell us about your puppy's homecoming and/ or training experience. We will publish your experience on our website so you can share your experience with other families. 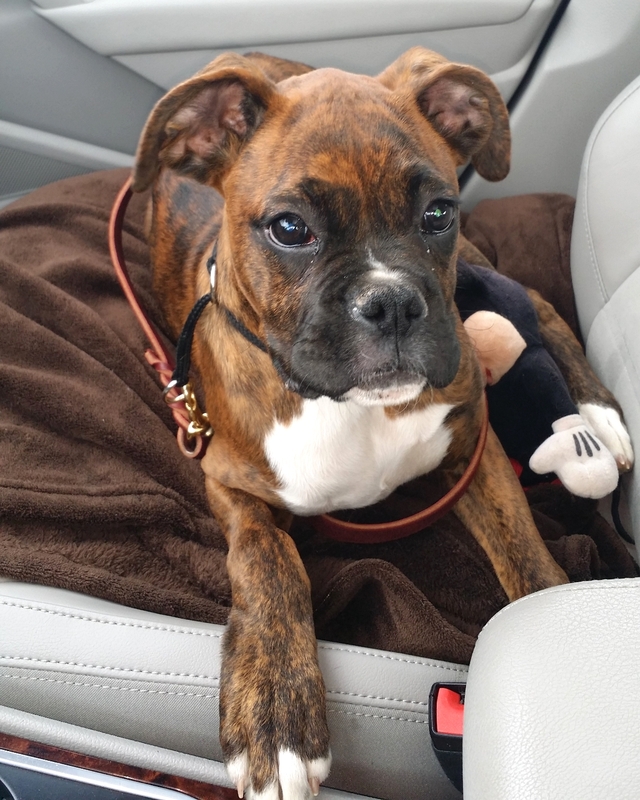 Thank you for giving Kloud 9 Boxers the opportunity to connect you with a new furry member of your family. If you have not yet picked a puppy to join your family, please read the testimonials below from our many happy Kloud 9 families. We are positive they will assist you in making such an important decision. Here are Testimonies from just a few our our Kloud 9 Families ! OH MY! I just love this pup sooo much! She has brought thousands of smiles and tons of laughter to my home. Witnessing the joy she brings to my family makes my heart explode with happiness! Thank You Kloud 9 boxers for bringing this bundle of happiness into my life! Wanted to give you an update on Louie, he is doing really well, and growing so fast. 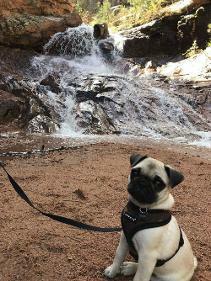 He loved our trip to seven falls this weekend!" together in their crate and fell asleep. them. Our little furry babies More pics to come! I wanted to share some recent pictures of Bruno. We absolutely adore him and he has been a great addition to our family. He is growing so fast, a great sleeper and loves playing with our girls. He is also coming along with his house training. Attached are a couple of pictures of Bruno playing with a Halloween toy, Bruno with my youngest daughter, Bruno with my mom, and Bruno at his 12 week veterinarian appointment. Hi Dora, I'm lindsey, Karen Lebel's daughter and wanted to share more about our perfect baby! Finley is learning so fast and has such a silly personality. He loves to be outside & play with our family and loves to be physically as close as possible . He's growing SO fast and is getting more cute each and every day! Here's a few of our favorite pictures. Jaz is the sweetest most adorable boxer boy. ..he's a wonderful addition to our family...and very relaxed and happy in his new home. ..we just love him! Thank you kloud9! Boone is doing great and has such an awesome personality. It's amazing how smart he is - he sits, shakes, lays down, and knows "night night (his kennel)". He's slept through the night since the first week and did great at his 3 month checkup earlier this week. We can't thank you enough for everything! Breton sure likes to nap :) she is over a week without an accident in the house, and she already goes to the door when she wants to go out. And listens to the word "no." I'm in awe everyday at how smart she is already. You sure breed super puppies! I love this pug more then life it's self. Thank you for giving me an amazing puppy! 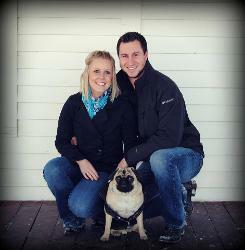 I couldn't ask for a better pug! Him and I are playing as we speak lol....did y'all get both emails? The other one was pictures our friend took! Aren't they awesome!? Hi Dora he is doing amazingly!!!!! He slept through the night , and hasn’t even had one accident in the house yet. He is eating and drinking. He is the sweetest puppy in the world!!! Loves to cuddle. He loves his rope and his KONG Wubba the most ❤️. Oliver our cat loves him, they touch noses it’s so cute!!!!!! He is spoiled thank you soooooo much!!!! Hi! I can't believe my baby is a year old now. Delilah has been such a blessing to our family! The day after we picked her up we found out we were pregnant with our first child. Delilah loves our daughter and keeps a watchful eye on her at all times. She would love if we would let her sleep under her crib. Delilah is one spoiled puppy who likes to cuddle and play. She is doing great! Thank you against for giving us such a sweet blessing. Oscar is the most well behaved dog (puppy) I have ever owned. For any dog, especially a boxer, he is as calm as any 1 year old can be. He is great with kids; he is gentle and loves playing with them. He is very smart as well. I taught him to sit in about 20 minutes and shake in about 5 minutes. We could not be happier to have him in our family. He is also not a barker!!! The few times he has barked is when we were playing with him. He is also a good watch dog. He sleeps in our room and one night he started growling at the door, so I looked outside and someone was standing by our back fence. (They were just walking buy and stopped to let their dog pee but he didn’t know that). Atticus, as you can see, is loving his back yard full of friends! He loves racing up and down the fence line harassing deer and chasing bunnies. He loves to climb on the rocks and play chase. Potty training is going very well--he is sooooo smart! He goes every Thursday night to puppy obedience class and puppy play time on Saturday afternoons. During the week, he loves to work on his puppy lessons, go for walks, snuggle with mommy, and play with all of his toys! His little boy parts are in place, so we are getting ready to have him neutered. I am waiting to do this as I have decided to return to work in the NICU and will work nights which will leave me free to be home with him during the day. 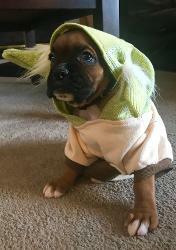 Hope all is going well with his siblings and all of your beautiful boxers! We just wanted you to know how much we just love this little boy to pieces! Thank you so much for allowing us to have him! I still am so thankful for finding your website and miraculously finding this sweet little one! He has brought so much joy to us in the short time we have had him! We are looking forward to many, many more years of silliness and love! Shawn says I'm obsessed with him. I say not obsessed but very much in love. My 5th boxer and by far one of my most favorites. He can sit and lay down and walks with my 3 miles every morning with no leash. He doesn't leave my side. I'm a forever fan of Kloud 9. Maybe even your number 1. I just wanted to send you a message stating that WE ABSOLUTELY LOVE OUR BOXER Moose. He is so vocal and has a fantastic personality. I honestly do not think I will ever get another breed. He is so fun and he enjoys playing, running, water. He is everything I could have ask for and more. Here is him sleeping after a long day at doggie day care. I will have my wife send you more for I am in Afghanistan and do not have access to many photos. 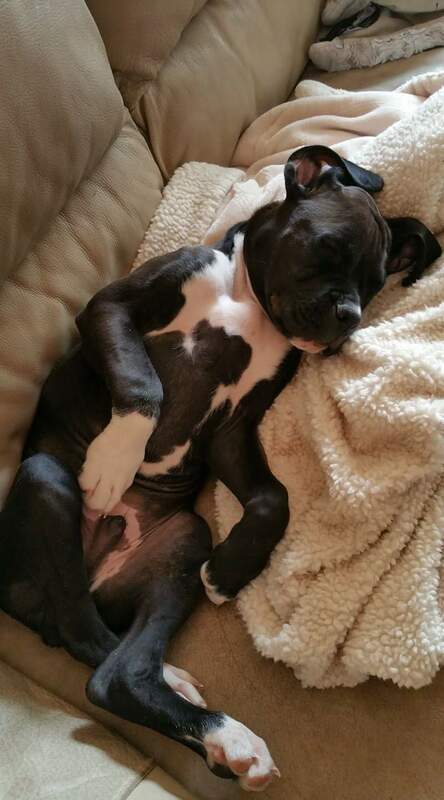 Kloud 9 boxers is an amazing place that breeds happy/healthy dogs. They do an excellent job. I personally own 2 dogs from Dora and I would strongly recommend buying from her again. My dogs are thriving here in my home, and they are very healthy, happy, loving and affectionate!! Wanted to send you some pics of Sugar Ray. He is healthy and growing strong. He doubled his weight in four weeks from 10 lbs to 20 lbs. Daddy and Lucy should be proud! Hope all is going good for you all. 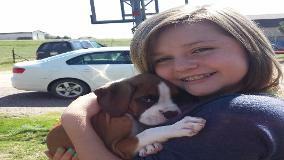 Working with Kloud 9 Boxers was a great experience and I now have the best puppy from them! They were very helpful and responsive—they breed healthy, happy puppies. Lola is a pure joy; she is the sweetest little girl, loves to cuddle and is very smart! 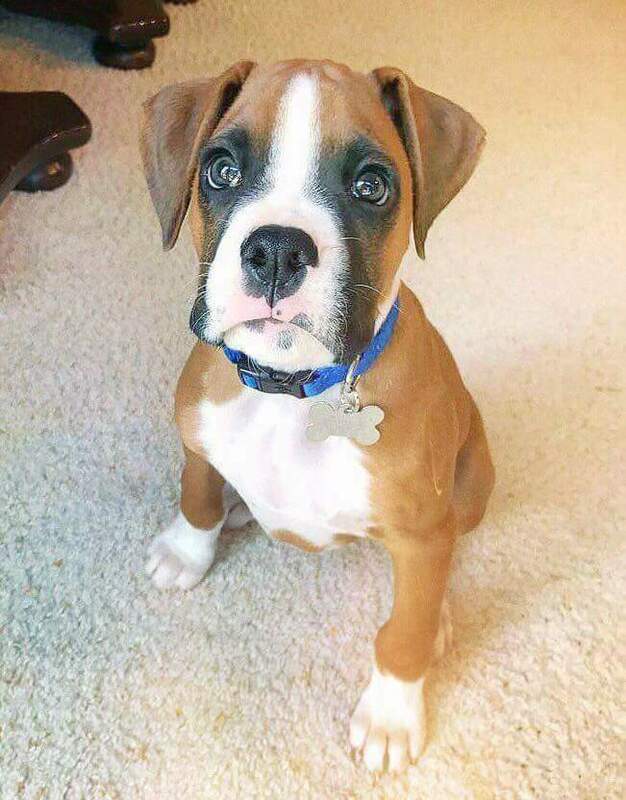 I would absolutely get my next boxer from Kloud 9 Boxers and recommend to anybody who would like a boxer puppy. Been meaning to write to you but have just been so busy and in and out of town! Dexter is doing great! And he is getting so big! He is about 40 pounds already. Of course that is just me holding him on the scale so give or take a few pounds. I can’t tell you how many times people have said what a “good looking dog” he is. We just got his sister 2 weeks ago (chocolate lab, Dixie) and he was a breeze compared to her, she is a little nightmare. He was sleeping outside of his “tent” after only about 3 weeks and sleeping through the whole night. And he is very smart, knows sit, shake with both hands, lie down, roll over, get on his bed, get in the truck/car, and inside the car either get in his seat (shotgun) or get in the back. At work he stays in my area even when the other dogs tease him, he knows he is not supposed to go up the stairs. And my favorite, I can point at him and pretend to shoot him and yell “BANG” and he falls over on his back. He likes to fetch inside but when we are outside he runs to get the ball and then gets easily distracted by the outdoors J He is just so much fun. He and Dixie love each other so much, they play all the time and he has even been protective of her when another dog barked at her on a camping trip. He is protective of us too and barks at the doorbell and strange people, depending on the situation. I just wish some of his smarts and trainability would rub off on Dixie! They are complete opposites, he absolutely hates the sprinklers in the yard and will not go near them and she’ll just roll around in them. We tossed them both in the shallows of a lake and she’s like a fish, he obviously is not. It is so funny to watch him swim, so clumsy. I don’t think he really minded that much though because he let me toss him in again and again and never even tried to run away. Ahh so much more . . . we’re having a blast with the both of them, but he is my baby J (don’t tell meg I said that). We just got our pictures taken with both of them, meg’s cousin is a photographer, I’ll have to send oyu a few when we get the disc. I attached one here of him sleeping yesterday on his back like he usually does J Well, gotta run, take care! Sorry it has taken me so long to write you back! I wanted to be able to send some good pictures with this email. Sabra is doing great! She has gotten so big over the past couple months! She's full of energy and personality. She's sooooo beautiful too! everyone comments on how gorgeous she is! I am so glad that she has become a part of our family. Thank you so much! To write a testimonial for Ansel is actually pretty easy since he's such a great dog. First off, when it comes to boxer attitude Ansel is 100% pure boxer. He's fun loving, a little goofy, and a total sweetheart, yet he has that innate Boxer ability to judge people, which also makes him a good protection dog. He loves to play with other dogs, especially in the water, but when we're alone he'll play fetch and tug with his tennis ball on a rope until he's completely worn out. Like all Boxer's he is a high energy dog, but he's well adjusted, he's not anxiety prone or nervous. This can be attributed to being raised in a home as opposed to a kennel. His exposure to other dogs as well as children and adults has made him a really well rounded dog. He's just as comfortable curled up on his bed as he his sleeping on the couch with one of us. Physically he is also impressive, he is a strong, well proportioned dog and he certainly meets the breed standard. When people first see him they usually make a comment along the lines of "Impressive beast" or something similar because of his muscularity and physical presence. He loves to sit in the window and look out at the world and it's interesting to see people's reaction when they first see him. I don't think I have to worry about intruders. I've had dogs for a great many years, some were great dogs and some were not so great, but there always a few stand-outs. Dogs whose attitudes and abilities make them head and shoulders above the rest. Ansel is certainly at the top of that list, he has the heart of a lion and the soul of clown all rolled into a 75 lb. Boxer body. Some things in this world were just destined to happen, and Ansel coming into my house was undoubtedly one of those events. It was synergy, the picture is now completed. He's a wonderful dog and an amazing fit in our family. I'm very lucky to have him here. Thought I would send you a picture of Duke. He's growing fast and truly does have a wonderful personality. Nana was amazing last night. I let her fall asleep in my arms and then put her in her kennel. She was out all night till 7:30 am this morning. Thank you so much for this wonderful bundle of joy. I will send pictures soon. It's Hugh and I just wanted to finally get around to sending you that e-mail about little Torin. He's a little over four months now (almost 19 weeks) and he's doing great! He's around 35 lbs and full of energy. I've had him in a few training sessions and he seems to be picking up commands really well. 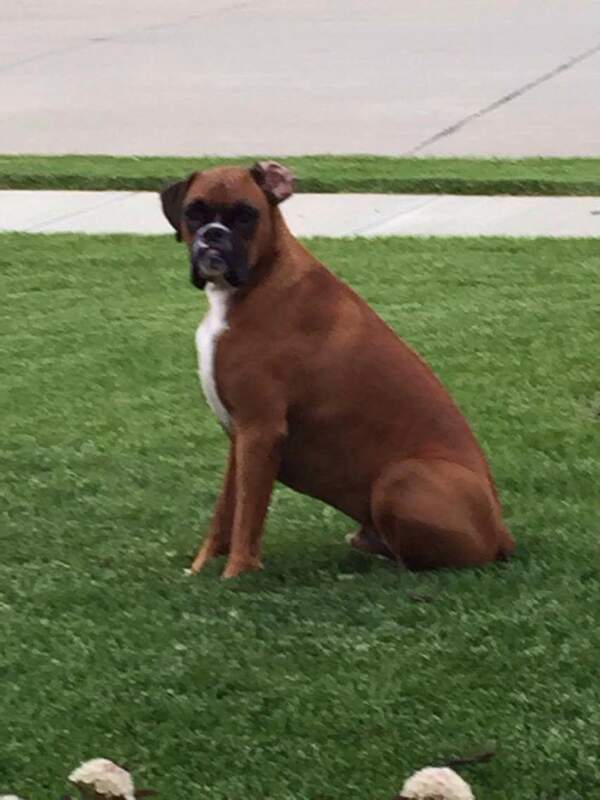 Over all of the years I've had boxers, I definitely think he's one of the smartest. Everyone we meet loves him and he loves them in return. He's great with every dog he meets. There's even a little female boxer puppy that just moved into the complex that he's very protective of. Here's a few pictures! I'll keep you updated. Just a quick update to tell you how Henry is doing. and hopefully loving life as a Moser....he's a good boy! time....I'll also send you a video of him snoring. Little did we know when we picked up Maya we would be picking up one of the best additions to our family. Maya is the world’s sweetest dog. She has so much love and joy. The best end to a long day is coming home to my dogs. Maya gets so excited that her little nub wiggles so fast it about touches her nose! She was so easy to train and she knew all the commands within minutes. However, she has a bit of a stubborn streak in her so if she doesn’t feel like doing something she just looks at me with those adorable puppy eyes and I can’t help but smile! Her and her sister are best friends and where one is the other is soon to follow, they don’t go anywhere or do anything without each other. This includes getting into trouble! She is protective and an all-around excellent dog. She is always wherever we are and is such an integral part of our family. She has the best personality of any boxer I’ve met and she has truly enriched our lives. I was told before we got a boxer to be aware that we were about to get a 65 pound lap dog. Boy is that true! Maya thinks she weighs about 13 pounds and wants to sit on you all day! If she needs love she will flop herself across our laps to make sure we know she is there and needs attention. If that doesn’t work then she just licks until she gets what she wants! She is amazing and we can’t imagine life without either one of our babies. Thanks for your note, and yes, you did answer all of our questions! Ryan and I raved all the way home about how wonderful you are, and how very special your whole family is. The puppies have had a big day being introduced to everyone here at home, and we have adored cuddling with them. I've attached a couple pics! Thanks for being so good at what you do. And I am sure we ill see you at the reunion. We have had our boy Big Jake for about 3 weeks now. So far everything is wonderful! He is the sweetest little puppy! We have truly fallen in love with him. He fits into the family dynamic perfectly. One of his favorite things to do is chase my daughter around the house like a little wild animal, so funny to watch. He also enjoys "pouncing" our cat who is much larger than he is at the moment, no fear! And he's so smart, already has mastered "sit" and "go night night" :) We just love him! 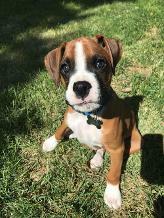 I would definitely recommend Kloud 9 to anyone looking for a Boxer! I wanted to RSVP for the Kloud 9 Reunion next weekend for myself (Aubree Deimler), my husband (Ryan Deimler) and our boxer (Alice). I've meant to email you sooner, but things have been crazy with the new puppy and Ryan's business. I attached some pictures of Alice from the last month or so. She's gotten so big, and she has crazy hops! She is the smartest dog I have ever known. She knows so many tricks - sit, shake, rollover, play dead, hop, sit up, speak and high fives. We trained her to hit the bell on the door when she has to go potty. She is such a little cuddler still and LOVES the sunshine. She finds it no matter where it is during the day. We are looking forward to getting to meeting more boxer families next weekend. amazing gift of perfection in Brick & Bronx. Know you have made our family complete! I hope all is well. I want to share a couple of pictures of Zoey. She is from Cisco and Lucy's July 1, 2012 litter. She is getting big and is a wonderful dog. Zoey has the typical Boxer energy and loves people and other dogs. I enrolled her in an obedience class last winter and she passed her final test with a perfect score. She's so smart and probably takes after her parents. She is still working on impulse control, but is getting better. I just wanted to let you know that she is doing well and has been a joy. Thanks you for taking care to breed great Boxers. I tried to send this through Facebook, but it failed. Feel free to share her pictures. I just wanted to drop a quick note and let you know how much I adore Muriel. She is such a love and is getting so big. I attached a picture so you can see how big and gorgeous she is. I get compliments on her manners and temperament everywhere we go! She went to camp with Jayne, and brother Thor was there part of the time with Muriel and I have pictures of them together somewhere and will send when I can. Hope all is well with you and yours. We love her SO much! And she seems to be adjusting well - happy and cuddly. Thanks again for the incredible job you've done with her! I don't know if you recall, but my husband Jeff and I purchased a pup from Cisco and Josie's litter from last November, and we named him "Walter." Anyway, we recently moved out to Conifer, and have 2.1 acres, most of which are fenced for Walter and our female boxer, Lily to enjoy. He is a wonderful companion and such an important member of our family. He has a great personality and we do our best to give him as much love as he gives us because it is certainly hard to keep up! I have attached a couple pictures of him to share. Anyway, I hope you are doing well, and thanks again for bringing such amazing puppies to families like us; we couldn't be happier! Hope all is well and life is good! I hope this note finds you well. I thought you might enjoy pictures of Muriel on her birthday. She has grown up so much and has brought much joy to my life. I am so thankful that I found you and you allowed me to take home one of your precious babies! I have attached 2 pictures for you. One is of her first week home with her kids, whom she loves more than anything, and the other is from this morning with her wubba. If she is awake, there is a toy stuffed in her maw! I wish you and your family a lovely Thanksgiving and Christmas! Rhodey's training was a great investment. Everyone can't believe how well mannered he is for how young he is. He definitely knows my voice and commands from everyone else. He is doing well. He's spending time with his friend so I hope to get new pics. My friends have told me he has my character and personality. It's awesome. Jut wanted to send a note with a picture of Muriel. She is doing great and is my little love bug. The photo is from our hike this morning. She got home covered in mud and she needed a bath and now I have to clean out my car but was totally worth it. I keep thinking about you telling me when I first picked her up that I would want another. Oh my gosh, do I ever! I get so many compliments on her from everyone. From her looks to her temperament she is the perfect dog. I cannot shower you with enough thanks! Just wanted to touch base and let you know that Apollo is absolutely amazing! He is your prototypical boxer. He's so funny and hyper, but sweet and loving at the same time. I have attached a few pictures from our vet visit today for his shots. Thank you so much for taking gray care of him. He's way more awesome than I ever could have imagined. It was my pleasure meeting both you and Mark. I feel so fortunate to have found you and to have purchased such a wonderful puppy from you. I have renamed him Kai :) Kai is doing wonderful. We had park/bonding time twice yesterday, and this morning. He's getting plenty of backyard time as well. He is bringing a great deal of joy to my life, and I can only thank you for that. I will keep you updated and post photos to the Kloud 9 Facebook account. I've attached a pic of Zeke asleep on his big boy doggy bed from this Saturday - he still likes to snuggle on his little puppy bed but he's quickly outgrowing it!! He's already gotten so big, but he's still got a ways to go before he's all grown up! He enjoyed the holiday weekend - lots of naps and time to play with the kids. He's been missing them when they're away at school. He's so handsome, Dora!! I can't even!! I love his little white spot on his nose and his super dark face and mostly dark body. His reddish fawn shines through whenever the suns shines directly on him. So, SOOOO handsome!! Also, I thought you should know that your thumb made it to our family picture collage. I've attached a pic of that as well. I'm glad you got your birthday present. The only problem with it is that the puppies' tails aren't docked. 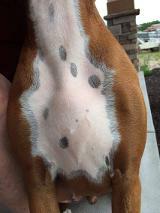 Otherwise, you could totally say they are boxers!! Maybe a couple coats of paint in the right spots could fix that though. I still feel like a big dork that I forgot to bring it with me on our puppy pick-up day. I was so excited to pick up Zeke and make sure I brought all we needed for him that I totally left your present sitting on our breakfast bar counter. I promise to keep in touch!! Ps... Can you see my posts on my FB page? I've got a whole album of Zeke's first day(s) with us. I don't know how to post to yours. I'll try to figure it out. Pps... This is sooo totally too early but, when we're ready to add a girl to our family, I'd love to get a fawn pup that will look just like Zelda or Lola when she grows up. I've already named her Honey. <3 I'll let you know when we're up for our next "potato chip"! Haha! Email from Cheri.. Hi! Not sure you remember us- we got Toby from you 4 years ago. He has been a delight!! Well behaved, smart and as sweet as they come! Thank you for blessing us with him!! I captured the natural heart shape on his chest and will send a photo- we think it is amazing because he has such a wonderful heart for everyone!! We just wanted to give you a quick update on Boone. You would think that Boone has been with us for a year, not just a week... It's amazing how smart he is and how quickly he picks up new things. He sits (like Abby) before he eats or gets a treat, does really well on a leash, goes potty right when we take him out, and is sleeping really well. In fact, he has not cried at all the past few nights and even slept all the way through the night last night. He whined for about the first 2 minutes the first few nights but it was unbelievably easy to get him used to the kennel. We're so thrilled to have the little guy and can't thank you enough for everything! He's currently laying on my lap as I type this - probably his way of saying hi to you guys. She is beyond wonderful! I don't have any questions at this time but thank you for checking in. She slept the whole way home, and was a little reserved at first and needed a lot of cuddling but she's now an active goofball, is eating well and is currently sprawled out snoring in her bed. I can't believe that she's already mastered fetch with a tennis ball, we're doing a little bit of work on the potty training but it's more her teaching us when she needs to go outside and it's getting better, and she initially had trouble sleeping in the kennel last night but calmed right down and was a gem through the night once we gave her a night light. She's been so sweet to everyone who wants to say hello, but even better is she never tries to follow them but always comes back to us. She's a keeper :) thank you so very much for her, and please feel free to contact me anytime if you're wondering how she's doing. Ruckus has come a long way since that cold December day when we picked him up. We wanted to send a quick update on Ruckus. He's such a great dog! He's up to about 25 lbs and growing like a weed. We've had him in puppy preschool classes at Denver Paw School and he's a very quick learner. We knew he was going to be a great dog, but he has certainly exceeded our expectations. This photo was just taken this morning. Feel free to post! He's really a lot of fun!